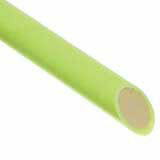 Jameson's 6' JE Series Foam Core Extension Section w/ Female Ferrule by Male Ferrule. Extension sections can be added to your head pole (either a saw section or pole pruner) to increase your reach to the desired height. The extension section are also used with Quick Change tools where the tool plugs into the female ferrule of the extension pole. 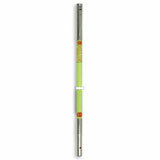 At 1-1/4" diameter, the original JE Series foam core fiberglass pole is still Jameson's highest quality pole. Its strength to weight ratio is unmatched by any pole on the market. In addition, it has increased flexural strength and a moisture barrier for high dielectric protection (the ultimate in safety), making it the right choice for line clearance. Every JE series pole is tested to 100KV per foot for five minutes. Jameson uses aircraft grade aluminimum ferrules with an exterior leaf spring locking button, giving a secure and positive connection when attaching pole extensions and accesories.